Rev. James Lewis Stoll, who died on December 8th 1994, was a Unitarian Universalist minister who became the first ordained minister of any religion in the United States or Canada to come out as gay. He did so at the annual Continental Conference of Student Religious Liberals on September 5, 1969 in La Foret, Colorado. Later, he led the effort that convinced the Unitarian Universalist Association to pass the first-ever gay rights resolution in 1970. After training at Starr King School for the Ministry, in Berkeley, followed by ordination, he served as pastor at a church in Kennewick, Wash., from 1962 until 1969. For reasons that have not been disclosed, he was asked to resign, and then moved to San Francisco, where he shared an apartment with three others. 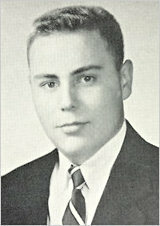 In September of 1969, he attended a convention of college-age Unitarians in Colorado Springs. One evening after dinner, he stood up and came out publicly as a gay man. He declared his orientation, stated that it was not a choice, that he was no longer ashamed of it, and that from then on, he would refuse to live a lie. After the convention, Stoll wrote articles on gay rights, and preached sermons on the subject at several churches. The following year, the full annual meeting of the Unitarian Universalist Association passed a resolution condemning discrimination against homosexual persons, beginning a gradual but irresistible move towards full LGBT inclusion. No action was ever taken by the church against Stoll, and so he remained a minister in good standing, but he was never again called to serve a congregation. It is not clear whether this had anything to do with lingering prejudice against his orientation. It could also be on the grounds of some suspicions of drug abuse, or of inappropriate sexual behaviour. Stoll’s name is not well known today, but for this brave and honest public witness, he deserves to be better remembered.In declaring himself, he was not the first ordained clergyman to come out, but he was the first to do so voluntarily, and the first in an established denomination. His action undoubtedly made it easier for the others who followed him, and to the formal acceptance by the Unitarians of openly gay men and lesbians in the church, and to the now well-established process to full LGBT inclusion in so many denominations.